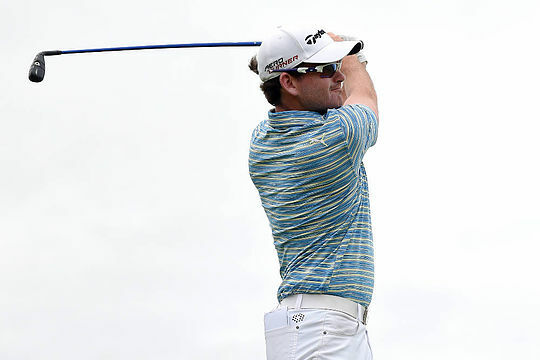 New Zealander Josh Geary leads the Fiji International after a windswept first round. Playing in one of the last groups of the day, Geary stormed home with two birdies in his last four holes to shoot an even par 72. Geary was the only player in the first round to shot even par with his nearest competitors two shots further back. “All in all it was a hard day and I’m pretty happy with 72,” said Geary who has notched up three victories on the PGA TOUR China this year. Also playing in the afternoon field was tournament drawcard Matt Kuchar, who was pleased to be finished at 2-over the card. “It felt like survival for sure, I don’t think I sniffed breaking 80 yesterday; I knew this course was really hard with this much wind,” said Kuchar. Kuchar’s round was highlighted by an unusual situation on the par-4 2nd, where the wind literally blew his ball into the hole. “I gave it a second, because I knew my putt earlier had rolled backwards, and sure enough the wind finally took it and blew it right back into the hole,” said Kuchar. Alistair Presnell, Daniel Nisbet, R.J. Caracella and Australian Masters Champion Nick Cullen also join Kuchar tied second on 2-over 74. Rounding out the top-10 on 3-over the card are Peter Cooke, James Nitties, Scott Laycock and Mathew Goggin. Meanwhile Antonio Murdaca in his Pro debut finished the first round on 4-over the card after briefly co-leading with Kuchar. The first round was suspended due to darkness with two groups finishing their rounds this morning at 6.30am.